Sometimes we can see our challenges in a new way when we have an opportunity to care for an animal. Equine therapy is a type of therapy that uses equine activities to treat physical, emotional and behavioral problems. Horses are social animals. They can mirror the feelings of the people working with them and they are responsive. They are also large and intimidating animals, which means people working with them must learn to trust them. This makes horses ideal for therapeutic treatments involving animals. Equine therapy is centered on metaphors. These metaphors mirror real life on many different levels and are used to raise a person’s awareness of issues they carry. As individual issues arise within the equine setting, clients have real-life opportunities to work through such issues. Equine therapy is an effective modality to learn skills such as teamwork, communication, and problem solving. It provides a natural setting in which to face fears and increase confidence and self-esteem. Equine therapy consists of a trained therapist and a horse professional to conduct the therapy. Research studies demonstrate working with animals or pets can make people calmer and happier. Equine therapy includes activities such as feeding, walking, riding, or grooming the horses, and engaging in equine tasks. What kind of disorders does equine therapy help? Equine therapy is used to treat a variety of issues, including ADHD, eating disorders, trauma and abuse, anxiety, depression, substance abuse, relationship issues, and communication needs. 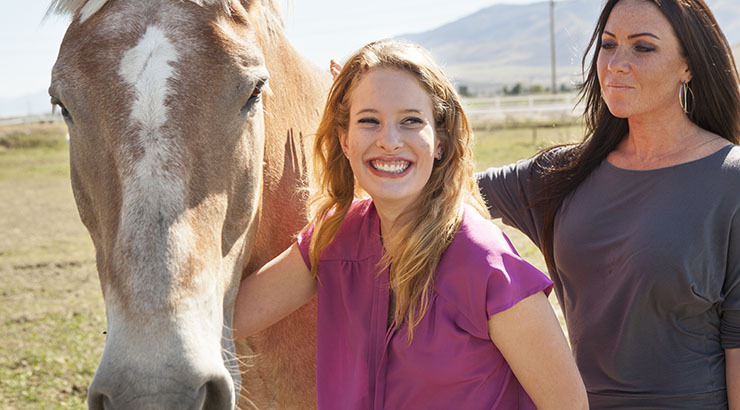 Equine therapy uses metaphors to provide insight and foster personal growth. It also helps participants develop healthy relationships as horses are non-judgmental and accepting, while being responsive. Some people who have difficulty opening up and trusting others may be able to do so with their therapist when they are engaging in a hands-on activity. How effective is equine therapy? More research is needed to provide scientific results for equine therapy’s effectiveness. Anecdotal evidence, however, indicates that equine therapy can be very effective. Where is equine therapy offered? Equine therapy is typically offered by residential treatment facilities or at spas or ranches where therapeutic interventions take place. Equine-assisted Psychotherapy: Healing Therapy or Just Hype?